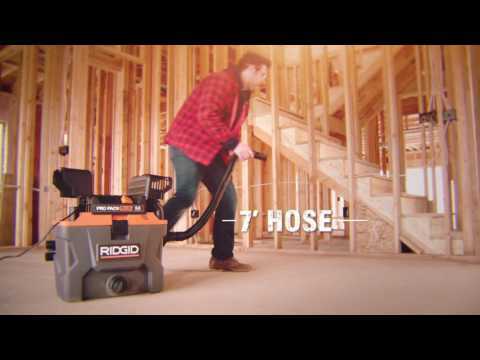 The RIDGID WD1022 is the ultimate wet dry vac for contractors. This 10 Gal. Wet Dry Vacuum features a unique, toolbox design for portability and easy storage with accessories and power cord storing inside compartments on the vac. The extra sturdy cart allows you wheel it and your tools right through the door and to the job. The 5.0 peak HP motor provides the required suction power to tackle most messes. The 7 ft. expanding hose won't pull loose during use. The Qwik Lock fine dust filter captures everyday dirt and fine particles such as dry wall dust and is quick, easy, and secure to install or remove. Unique toolbox design makes easy portability and storability. Accessories conveniently store inside the shop vacuum. 20 ft. power cord stores conveniently inside toolbox compartment. Patented Qwik lock filter fastening system- makes installing or removing your filter, quick, easy and secure. Large non-marking rear wheels- move easily over rough terrain, retractable cart handle makes maneuvering easy. Built-In accessory storage- includes utility nozzle, dusting brush, crevice tool and 2-extension wands, all accessories, wands and hose store compactly on-board. Oversize drain opening- conveniently located at the drum's lowest point allows for quick and complete liquid disposal. 10 Gallon Pro Pack Plus Wet Dry Vac is rated 4.2 out of 5 by 6. Rated 4 out of 5 by RoyWpg from great form factor Pros: This is so much easier to move around than the big old round 16 gal I have. Same power but the wheels and handle work so much better. And the bonus is that the attachments store out of the way. Cons: The drawback I can see is that the hose is not near long enough, but I understand its design on how well it stores away. Rated 4 out of 5 by super9295 from Beginner well,well it does what it's suppose to do.I recommend this product. Rated 4 out of 5 by Lesdlentz from Like how compact it is. Very easy to use and store. Very good product. Great how all tools fit nicely inside which also helps prevent loosing some. More than enough power for all general uses. Rated 4 out of 5 by Soupbone1948 from It is my first Ridgid purchase, will not be my last. Very well-thought-out design. The small foot print makes for easier storage in a small garage. Rated 4 out of 5 by Kilonen from Good vacuum Ridgid makes excellent vacuums - like this one. The ability to to stor all the tools securely is a nice plus for moving it from site to site. The storage for hose takes some getting used to - not all that convenient/intuitive - hence the 4 star vs 5.